Leafing through a brand new book to see your words and drawings in print is amazing. Is this how Marian Keyes or Eoin Colfer feels when they hold one of their brand new publications in their hands? 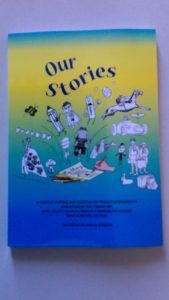 And the great thing is that about 40 people, from Senior Infants to Senior Citizens, shared this thrill when our community anthology, aptly entitled ‘Our Stories’, was recently launched! After a year’s work, from concept to completion, it’s so satisfying to have an end product that brought together people who wouldn’t otherwise have met each other. Like most parishes and communities in Ireland, Glounthaune in County Cork has its share of clubs, sports and social activities for various age groups. However, people from the different community groups generally don’t get to meet each other. So how did we achieve that through a creative arts programme? In March 2017, I attended a Creative Ireland Initiative meeting in Midleton Library that might be of interest regarding community Arts funding. Hosted by Cork County Council’s art department, the group were looking for suggestions for the County’s Cultural Strategy. As an Art Teacher who usually includes some cartoon drawing in my classes, I suggested a ‘Write and Illustrate your Story’ idea, encouraging people across the community to share their stories and enhance it with a drawing. As an avid reader (who reads everything from novels, comics to cornflake boxes), I’m with the Alice in Wonderland school of thought; “What is the use of a book without pictures or conversation?” Doesn’t drawing, too, play its part in storytelling? We can all do simple matchstick figures, so why not combine words and lines to create an illustrated story, comic or graphic novel? This arts project was aimed inclusively at everyone in the community. As a local Art Teacher, Illustrator and Artist in the Community, I assisted people in teasing out their story ideas – they didn’t need to be good at either writing or drawing to take part. Just having an interest was enough and we developed it from there! Stories ranged from very simple statements from young children like “I have a pet dog. His name is Fluffy. This is my family,” to an adventurous tale or funny incident. Older participants could similarly select anecdotes or fictional concepts to produce an illustrated short story. In fact, the older age-group wrote such compelling, personal tales, ranging from loss of homeland and loved ones to reminiscent memories of the past, that the reader can’t help but feel they have shared a part of the author’s experience. Our six-week set of classes began in February 2018. We had three groups – children from Senior Infants to 6th Class and lastly, the adults. Most already had their story idea. Some of the kids had fully developed characters like bullies, beloved pets or unwitting superheroes such as ‘Thunderboy’, ‘SuperDude’ or ‘Billy Bob Joe’. Arsela’s mother, Lindita, writes of her wish to help a child in need. She generously donates a lace quilt she made to be sold for fundraising, “It may have been very little, far from what she needs, but it was all I had at that moment.” Lindita’s altruistic generosity is both humbling and inspirational. There was the heartbreakingly poignant but joyful account of 4 year-old cancer patient, Alisa Savage, who was granted the trip of a lifetime to Orlando by the Massachusetts/Rhode Island ‘Make a Wish’ foundation. Alisha’s mother, Michelle, lovingly writes about Alisha’s last days, her young life lived to the full. We get an insight into Izzedeen Alkarajeh’s experience of fleeing Palestine with his family and coping with Ireland’s Direct Provision system. Izzedeen’s positive outlook is testimony to his perseverance in difficult times. It was a privilege to get to share people’s stories and artwork, and to make new friends in the process. 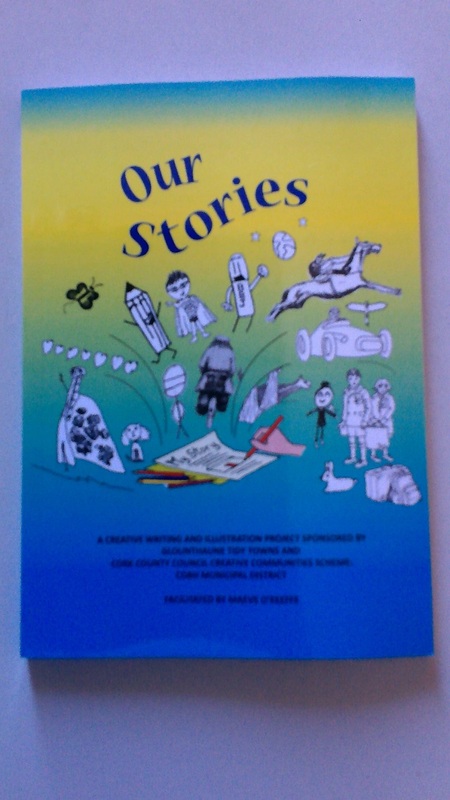 I was impressed by the storytelling ability of the children and by their comedic and fantastic tales. I was humbled by the harrowing accounts that people shared of their first-hand experiences of war, immigration and families being cruelly separated. I hope this book encourages participants and other readers to write more. Perhaps other communities might try something similar? Hopefully we’ll have future writers stemming from this experience, or inspire people, regardless of age group, to pursue their interest in writing and drawing. 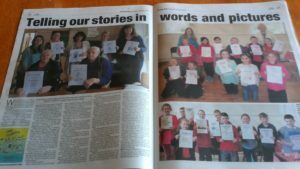 With our stories finally in print, we launched our book on Friday June 22nd at Glounthaune Community Centre, Cork. It was a night to celebrate our local writing and artistic talent, the fantastic volunteers and great community spirit that made this project possible. The story of ‘Our Stories’ was reported in the Cork Evening Echo on Thursday June 28th! This entry was posted in Community on June 28, 2018 by frazzledmammy.